More and more hospital wireless networks today are asking questions about mobile device management. What are the benefits? Is it really necessary? How hard is it to deploy? And so on. 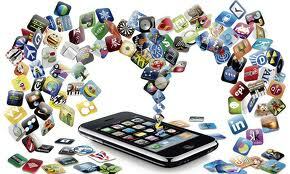 Here are seven benefits of mobile device management. There are all sorts of laws to protect the records of patients. And mobile devices are becoming a huge compliance challenge. The HIPAA requirements have set stringent rules and fines to go with them. With the HIPAA 2009 HITECH Act, an audit program now mandated, the fines can soar up to a staggering one and a half million dollars, if found out of compliance. The biggest compliance risk with mobile devices is data leakage, simply put- there is patient information on a mobile device and the device gets lost or stolen mobile device management helps with compliance of mobile devices. Doctors tend to be pretty savvy with technology, they work long hours, and they expect to have their personal devices work while they’re at work. Typically the technology folks would push back on any devices that they don’t own touching the network. But BYOD has a lot of benefits (other than just the benefit of no more complaining….which is a big one.) BYOD can be used for cost savings and productivity as well. Use MDM to make BYOD work for you. With the use of mobile device management, it is more difficult for thieves to access the sensitive information, regardless of where the employee happens to be at the time. For the physical situations, where a health worker may be on travel, domestic or overseas, if a handheld is stolen, the mobile device management software can be used immediately to wipe the handheld clean. The right MDM software can actually segment a user’s personal information from the corporate data and encrypt the sensitive files. So even if an employee resigns or gets terminated, the device can be “Selectively Wiped”. Only the corporate data gets removed. 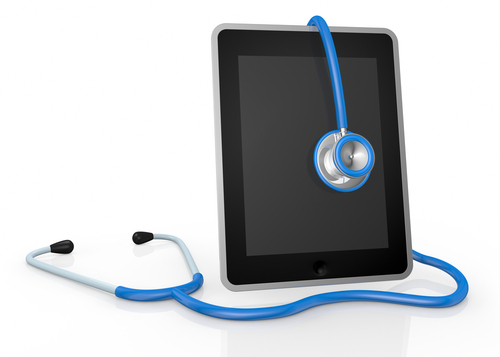 The trend is that more and more healthcare systems are being run on the mobile devices. 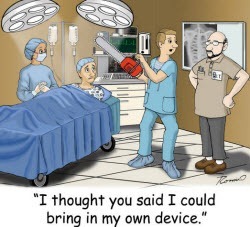 And not just netbooks- iPads, iPhones and AOS devices are the future of mobile in healthcare. 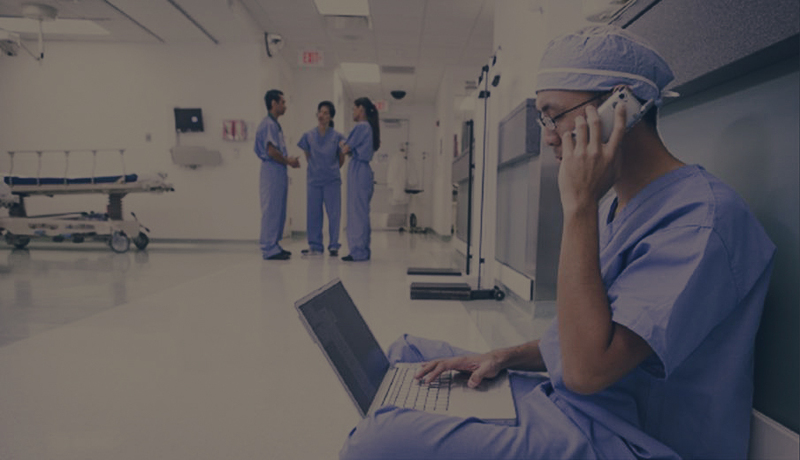 But if these devices become critical for patient care, the IT support team must have the ability to manage those devices and even take control of them when there are issues….similar to the way a remote desktop or programs like PC anywhere work. MDM can do this, and it’s a must have for hospitals. There are already some electronic medical record platforms that are being adapted to be used as apps running on iOS or Android devices. There are even Nurse Call applications that are simply iPhone applications integrating with a central server. What is for certain- is that the hospital needs to have the ability to load applications on devices that are necessary for the employees to do their jobs. They also need the ability to keep those updated, and then remove them when a process changes. MDM allows you to send the users an email or allow them to download the application on their devices. No more handing out the pre-shared key that gets passed around to everyone and no more configuring devices for the IT staff. Device enrollment is as easy as loading an app. MDM doesn’t require you to change your existing Wi-Fi infrastructure….however, I should note, that if your wireless networking doesn’t have the ability to handle a lot of capacity as well as manage and prioritize the types of users; you’re going to have issues with BYOD and the number of medical applications. But, assuming you’ve got a robust wireless network, MDM is simply an overlay to that network. There are no big changes to make to implement it. So as you can see, there are some great benefits to MDM in the medical environment. 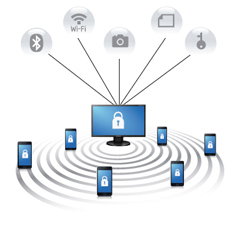 At SecurEdge, we specialize in creating these large scale wireless networks that maintain the highest level of security. MDM is a big piece of that. If your hospital is looking for help, you can contact one of our healthcare mobility specialists here. We’ll help you put a plan together to take advantage of the benefits I’ve listed here.